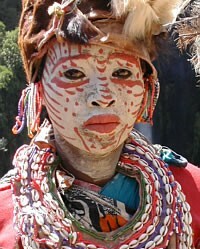 The Kikuyu are a Bantu people who makeup the largest people group in Kenya. They are related to their close cousins, the Embu-Mbeere. The Kikuyu tribe was originally founded by a man named Gikuyu. Kikuyu history says that the Kikuyu God, Ngai, took Gikuyu to the top of Kirinyaga and told him to stay and build his home there. He was also given his wife, Mumbi. Together, Mumbi and Gikuyu had nine daughters. There was actually a tenth daughter but the Kikuyu considered it to be bad luck to say the number ten. When counting they used to say “full nine” instead of ten. Due to their history of economic success, the majority of Kikuyu are well educated. They easily adapt to new realities adopting many aspects of modern culture. Today the majority of Embu-Mbeere are Protestant Christians. Pray that Kikuyu Christians to be a light to the nations. Pray that Kikuyu will grow strong in their faith.